We have no authentic record concerning the existence of “Witch Stitch Lace” until the second half of the Nineteenth Century. 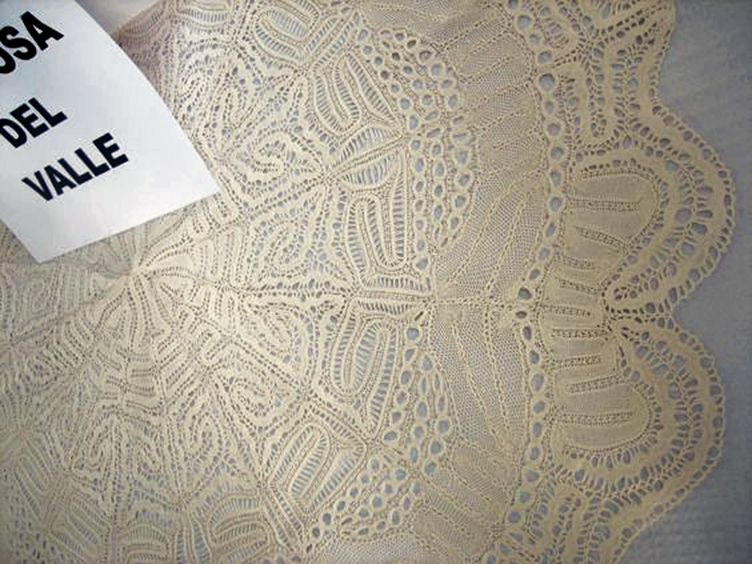 It can be said indeed that this lace is related with ancient numerical laces coming from East and South of Europe:Slovenian, Creta, Genoa, old Milanese . 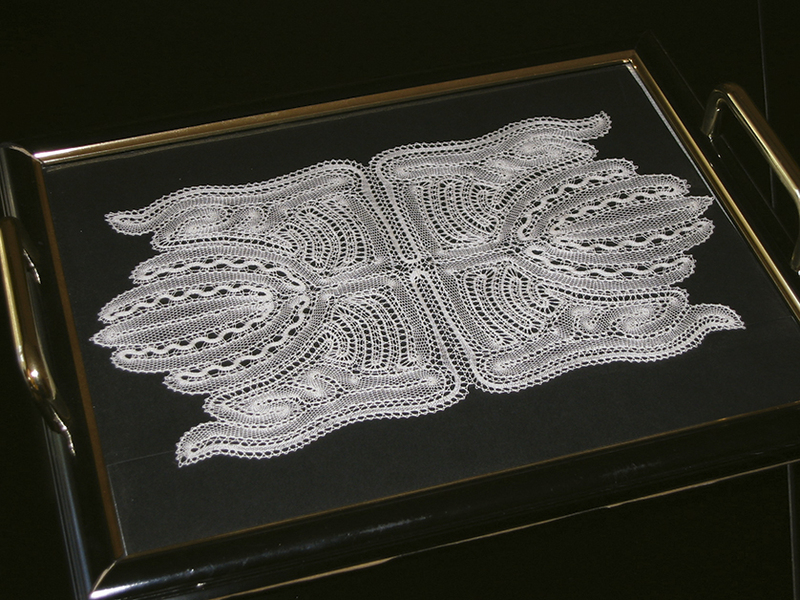 About 1920 a lace maker called Mrs. Candida Garcia taught to noble ladies of Sevilla this type of lace, which they worked join with embroideries as a pastime, and their handiwork came into use for priestly robes, household linen or religious purposes. 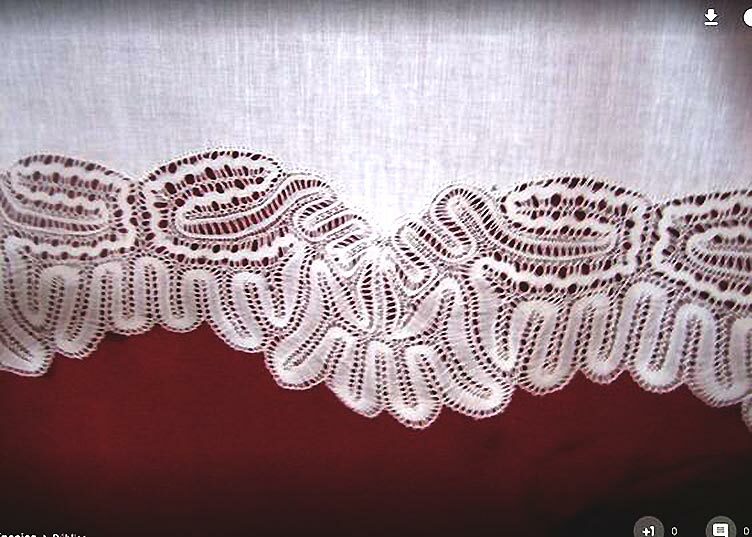 It exists the evidence that lacemakers worked Duchesse and Brugge laces too, though the most common and popular was Encaje de Hinojosa, also called Witchstitch, its nickname. Mrs. Garcia drew her own designs over green cards and, to give the pricking a more hardness and duration, stuck a linen on the back. 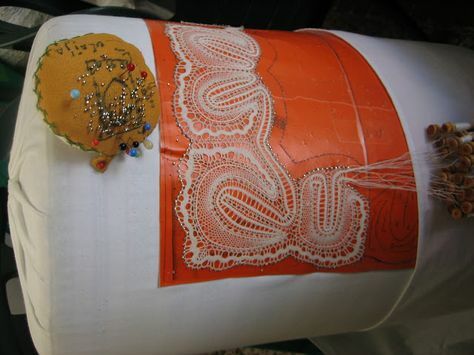 Witch Stitch Lace is usually made with 10 or 12 pairs of bobbins. Designs have not grounds nor fillings since the braids touch one to another producing a moving sense and changing so many times as needed to fill all spaces (unlimited and continuous moving). 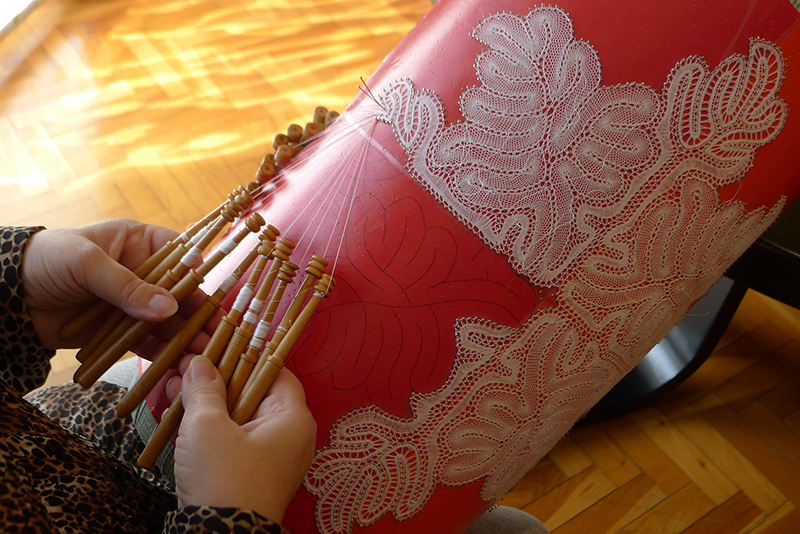 There are no dots drawn on the pattern, so the worker has to be a skilled lacemaker. Moving braids, worked with clothstitch, halfstitch and some transparent points, compose the pattern, with a final result of great plasticity to the finished work. The braids carry foot on both edges They are worked with fine threads, on a cylindrical short pillow 50 x 25 cm. set up on the lap. The knowledge of Mrs. Garcia spread on to Extremadura, where these laces were taught to girls at school and the craft pass from mothers to daughters until the 60’s. A lace workshop was set up and the young girls learnt and worked. Soon their laces were sent to sell to Barcelona and Madrid. Their earnings (some coins) were saved every week for their future household linen and their trousseau. 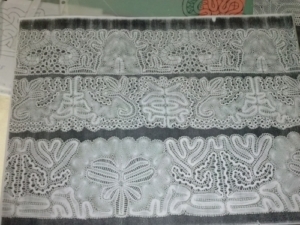 From 60’s lacemaking declined and its practice stopped, though lately it has not been completely lost, and I consider myself a lucky person as in 2002, I was teached by Mrs. Josefa Jimenez, (82 years old). 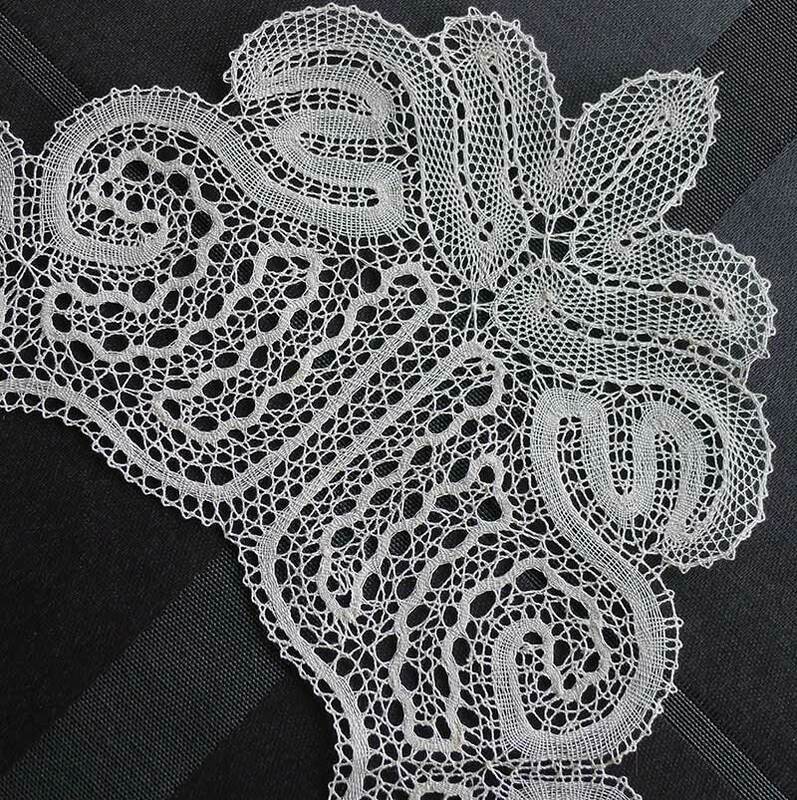 A marvellous lady with a great experience as she has been making lace since it was a child. She showed me her first lace as well as her first design too, that she had been keeping all her life and she made when she was 11 years old. I am now on the way to follow the thread and continue spreading her knowledge. 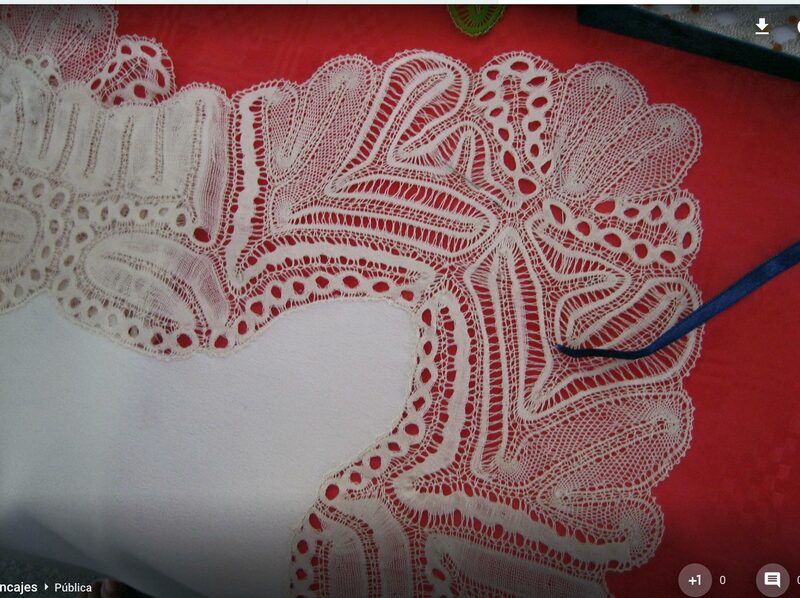 We can say that this lace is known since last century but it keeps the most antique technique.